Welcome to Daniel Kirby Roofing and Building. 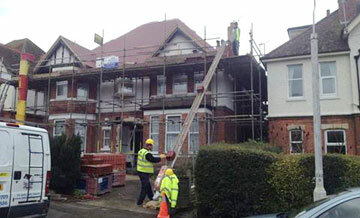 We are general builders and building Contractors in Folkestone and cover all building work. We work in Folkestone, Dover, Ashford, Canterbury, Lyminge. Hythe, Acrise, South East Kent, Elham, Hawkinge and surrounding areas. We do both commercial building including work for local councils and domestic building for private customers. We have over 20 years experience in all types of building. If you are looking for local builders in Folkestone and surrounding areas please call 01303 892705 or 07916 273886 today! Daniel Kirby Roofing and Building Folkestone offer a wide range of building skills covering all general building projects. 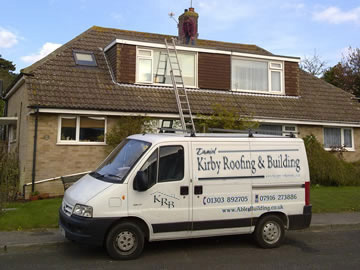 Call Daniel Kirby Roofing and Building Folkestone on 01303 892705 - or if you are looking for an extension or just need some repairs, we're sure that in choosing Daniel Kirby Roofing and Building you won’t be disappointed. Serving the homeowners and businesses of Folkestone, Dover, Hawkinge, and the surrounding area. we have vast industry knowledge and offer realistic prices. Call us to talk about all your building requirements. All kinds of building work including Structural alterations, Extensions, Garage conversions, Conservatories, Loft conversions, Brickwork, Kitchens and Bathrooms, Construction of new roofs, Chimney repairs & repointing, Chimney removal. We are highly rated by Which? Daniel Kirby Roofing and Building in Folkestone. We cover Folkestone Dover Hawkinge and the surrounding villages We specialise in building renovating and repairing . Some areas we cover are Structural alterations, Garage conversions, Extensions, Conservatories, loft conversions, Brickwork, kitchens and bathrooms, Roofing. Chimney repairs & repointing, Chimney removal, general building work. We work in Folkestone, Dover, Ashford, Canterbury, Lyminge. Hythe, Acrise, south east Kent, Elham, Folkestone, Hawkinge and surrounding areas. If you are looking for a local builder for your building project in the Folkestone area call Daniel Kirby Roofing and Building on 01303 892705 or use our contact form.